Wireshark is an open source network packet analyzer that allows live traffic analysis, with support to several protocols. Wireshark also allows network forensic, being very useful for CTFs for example (check my writeups for the D-CTF Quals 2014 and for the CSAW Quals 2014 in Networking and Forensics). In this blog post I introduce Wireshark and I talk about my favorite features. Before we are able to understand and analyze network traffic packets, we must have an insight of how the network stack works. 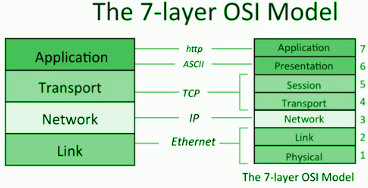 The Open Systems Interconnection (OSI) model was published in 1983 and is a conceptual model that characterizes and standardizes the internal functions of a communication system by partitioning it into abstraction layers. Represents the physical and electrical medium through which the network data is transferred. It comprehends all hardware, hubs, network adapters, cable, etc. Provides the means of transporting data across a physical network. Bridges and switches are the physical devices in this layer. It is responsible for providing an addressing scheme that can be used to identify physical devices: the MAC address. Examples of protocols in this layer are: Ethernet, Token Ring, AppleTalk, and Fiber Distributed Data Interface (FDDI). Responsible for routing data between physical networks, assigning the logical addressing of network hosts. It also handles packet fragmentation and error detection. Routers and their routing tables belong to this layer. Examples of protocols are: Internet Protocol (IP), Internetwork Packet Exchange, and the Internet Control Message Protocol (ICMP). Provides the flow control of data between two hosts. Many firewalls and proxy servers operate at this layer. Examples of protocol are: UDP and TCP. Responsible for the session between two computers, managing operations such as gracefully terminating connections. It can also establish whether a connection is duplex or half-duplex. Examples of Protocols are: NetBIOS and NWLink. Transforms the received data into a format that can be read by the application layer, such as enconding/decoding and several forms of encryption/decryption for securing the data. Examples of protocols are: ASCII, MPEG, JPEG, and MIDI. Provides the details for end users to access network resources. Examples of protocols are: HTTP, SMTP, FTP, and Telnet. The way the protocols on different layers of the OSI model communicate is through data encapsulation, where each layer in the stack adds a header or footer to the packet. The encapsulation protocol creates a protocol data unit (PDU), including the data with all header and footer information added to it. What we call packet is the complete PDU. For instance, in Wireshark we can track the sequence number where a higher layer PDU starts and stops. This allows us to measure how long it took to transfer a PDU (the display filter is tcp.pdu.time). All of the techniques for switched network are available on routed networks as well. However, for routers the sniffer placement becomes more relevant since a device's broadcast domain extends only until it reaches a router. Broadcast packet: sent to all ports on the network segment. Broadcast MAC address is ff:ff:ff:ff:ff:ff (layer 2) or the highest possible IP address (layer 3). Multicast packet: sent from a single source to multiple destinations, to simplify the process using as little as bandwidth as possible. Unicast packet: transmitted from one computer to another. Both logical and physical addresses are used for communication on a network. Logical addresses allows communication between multiple networks (indirectly connected devices). Physical addresses allow communication on a single network (devices that are connected to each other with a switch for example). ARP is the protocol used to determine which MAC address (physical address such as 00:09:5B:01:02:03 and belonging to layer 2) corresponds to a particular IP address (logical addresses such as 10.100.20.1, belonging to layer 3). The ARP resolution process uses two packets (ARP request and ARP response) to find the matching MAC address, sending a broadcast packet to every device in the domain, and waiting for the response of the correct client. This works because a switch uses a MAC table to know through which port to send the traffic. Every interface on an Internet must have a unique Internet address. An IP has the task of delivering packets between hosts based on the IP addresses in the packet headers. IPv4 addresses are 32-bit addresses used to uniquely identify devices connected in a network. They are represented by the dotted-quad notation with four sets of 8 bits, represented by decimal numbers between 0 and 255. In addition, an IP address consists of two parts: a network address and a host address. The network address identifies the local area network (LAN), and the host address identifies the device on that network. Version: version of IP used. Header Length: length of the IP header. Type of Service: flag used by routers to prioritize traffic. Total length: length of the IP header and the data in the packet. Identification: identification of a packet or sequence of fragmented packets. Fragment offset: identification of whether a packet is a fragment. Time to Live: definition of the lifetime of the packet, measured in hops/seconds through routers. A TTL is defined when a packet is created, and generally is decremented by 1 every time the packet is forwarded by a router. Protocol: identification of the type of packet coming next in the sequence. Options: for routing and timestamps. ICMP is the utility protocol of TCP/IP responsible for providing information about the availability of devices, services, or routes on a network. PING www.google.com (74.125.228.210) 56(84) bytes of data. The way traceroute works is by sending an echo request that has a particular feature in the IP header: the TTL is 1. This means that the packet will be dropped at the first hop. The second packet goes through the first hop and then is dropped in the second hop (TTL is 2), and so on. To make this work, the router replies response with a double-headed packet, containing a copy of the IP header and the data that was sent in the original echo request. PS: Check out this post from Julia Evans on how to create a simple Traceroute in 15 lines of code using Python's Scapy. Provides a reliable flow of data between two hosts with a three-way handshake. The purpose is to allow the transmitting host to ensure that the destination host is up, and let the transmitting host check the availability of the port as well. Host A sends an initial packet with no data but with the synchronize (SYN) flag and the initial sequence number and maximum segment size (MSS) for the communication process. Host B responds with a synchronize and acknowledge (SYN + ACK) flag, with its initial sequence number. Host A sends an acknowledge (ACK) packet. Host A sends a packet with FIN and ACK flags. Host B sends an ACK packet and then a FIN/ACK packet. Host A sends an ACK packet. Sometimes, however, connections can end abruptly (for example due to a potential attacker issuing a port scan). In these cases, TCP resets packets with a RST flag are used. This indicates that a connection was closed abruptly or a connection attempt was refused. standard port group: from 1 to 1023, used by specific services. ephemeral port group: from 1024 through 65535, randomly chosen by services. Sequence number: identify a TCP segment. Acknowledgment Number: sequence number to be expected in the next packet from the other device. Flags: URG, ACK, PSH, RST, SYN, FIN flags for identifying the type of TCP packet being transmitted. Windows size: size of the TCP receiver buffer in bytes. Checksum: ensure the contents of the TCP header. Urgent Pointer: examined for additional instructions where the CPU should be reading the data within the packet. While TCP is designed for reliable data delivery, UDP focus on speed. UDP sends packets of data called datagrams from one host to another, with no guarantee that they reach the other end. Unlike TCP, UDP does not formally establish and terminate a connection between hosts. For this reason, it usually relies on built-in reliability services (for example protocols such as DNS and DHCP). In the beginning of the Internet, when a device needed to communicate over a network, it would be assigned an address by hand. As the Internet grown, the Bootstrap Protocol (BOOTP) was created, automatically assigning addresses to devices. Later, BOOTP was replaced by DHCP. HTTP is the mechanism that allows browsers to connect to web servers to view web pages. HTTP packets are built on the top of TCP and they are identified by one of the eight different request methods. Collection: transferring the selected network interface into promiscuous mode so it can capture raw binary data. Conversion: chunks of collected binary are converted into readable form. Analysis: processing of the protocol type, communication channel, port number, protocol headers, etc. Network traffic sniffing is only possible if the network interface (NIC) is transfered to promiscuous mode. This allows the transfer of all received traffic to the CPU (instead of processing frames that the interface was intended to receive). If the NIC is not set to promiscuous mode, packets that are not destined to that controller are discarded. Packet List: list all packets in the capture file. It can be edited to display packet number, relative time, source, destination, protocol, etc. Packet details: hierarchal display of information about a single packet. Packet Bytes: a packet in its raw, unprocessed form. To start capturing packets, all you need to do is to choose the network interface. You may also edit a capture filter prior to the packet collection. black identifies TCP packets with problems. Statistics -> IO Graphs: Allows to graph throughput of data. For instance, you can use graphs to find peaks in the data, discover performance bottlenecks in individual protocols, and compare data streams. Filtering is available in this interface (for example, to show ARP and DHCP traffic). Statistics -> TCP -> Stream Graph -> Round Trip Time Graph: Allows to plot round-trip times (RTT) for a given capture file. This is the time it takes for an acknowledgment to be received from a sent packet. Statistics -> Flow Graph: Timeline-based representation of communication statistics (based on time intervals). It allows the visualization of connections and the flow of data over time. A flow graph contains a column-based view of a connection between hosts and organizes the traffic. This analysis can show slow points or bottlenecks and determine if there is any latency. Statistics -> Summary: Returns a report about the entire process by features such as interface, capture duration and number, and size of packets. Statistics -> Protocol Hierarchy: Shows statistical information of different protocols in a nodal form. It arranges the protocols according to its layers, presenting them in percentage form. For example, if you know that your network usually gets 15% ARP traffic, if you see a value such as 50%, you know something is wrong. Statistics -> Conversations: Shows the address of the endpoints involved in the conversation. Statistics -> Endpoints: Similar to conversations, reflecting the statistics of traffic to and from an IP address. For example, for TCP, it can look like SYN, SYN/ACK, SYN. Display filter: expression-based filter (for example not ip, ip addr==192.168.0.10, or arp). Hex value: packets with a hexadecimal (for example 00:ff, ff:ff). String: packets with a text string (for example admin or workstation). Right click -> Mark Packet or CTRL+M: Helps to organization of relevant packets. Type: ID name or number (for example: host, net, port). Dir: transfer direction to or from the ID name or number (for example: src and dst). where dst host is the qualifier, and the IP address is the ID. Capture filters: specified when packets are being captured. This method is good for performance of large captures. Display filters: applied to an existing set of collected packets. This method gives more versatility since you have the entire data available. In the following sessions I show several examples of capture and display filters. Traffic associated with a host's IPV4 address (also works for a IPv6 network). A TCP SYN scan is fast and reliable method to scan ports and services in a network. It is also less noisy than other scanning techniques. The attacker sends a TCP SYN packet to a range of ports on the victim. Open ports: replies with a TCP SYN/ACK packet (three times). Then the attacker knows that port is open and a service is listening on it. Closed ports, not filtered: the attacker receives a RST response. Filtered ports (by a firewall, for example): the attacker does not receive any response. Technique to determine the operating system on a system without have access to it. In Passive Fingerprinting, an attacker can use certain fields within packets sent from the target to craft a stealthy fingerprint. This is possible due the lack of specificity by protocol's RFCs: although the various fields contained in the TCP, UDP and IP headers are very specific, no default values are defined for these fields. Note: A nice tool using operating system fingerprinting techniques is p0f. In Active Fingerprinting, the attacker actively sends crafted packets to the victim whose replies reveal the OS. This can be done with Nmap. This will give a view of any malicious DNS request done without the knowledge of the user. An example is a case where a visited website has a hidden iframe with some malicious script inside. In a virtual machine look at statistics --> Endponts. There should be only one public IP address: the VPN server that the virtual machine is connected to. 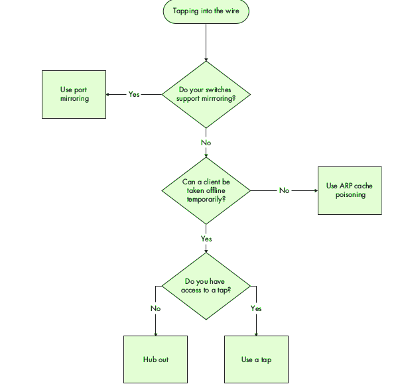 ARP cache poisoning allows tapping into the wire with Wireshark. This can be used for good or for evil. The way this works is the following: all devices on a network communicate with each other on layer 3 using IP addresses. Because switches operate on layer 2 they only see MAC addresses, which are usually cached. When a MAC address is not in the cache list, ARP broadcasts a packet asking which IP address owns some MAC address. The destination machine replies to the packet with its MAC address via an ARP reply (as we have learned above). So, at this point, the transmitting computer has the data link layer addressing the information it needs to communicate with the remote computer. This information is then stored into the ARP cache. An attacker can spoof this process by sending ARP messages to an Ethernet switch or router with fake MAC addresses in order to intercept the traffic of another computer. If you are in Windows, ARP cache poising can be crafted using Cain & Abel. In networks with very high demand, when you reroute traffic, everything transmitted and received by the target system must first go through your analyzer system. This makes your analyzer the bottleneck in the communication process and being suitable to cause DoS. You might be able avoid all the traffic going through your analyzer system by using a feature called asymmetric routing. The unique difference when capturing traffic from a wireless local area network (WLAN) is that the wireless spectrum is a shared medium (unlike wired networks, where each client has it own cable to the switch). A single WLAN occupy a portion of the 802.11 spectrum, allowing multiple systems to operate in the same physical medium. In the US, 11 channels are available and a WLAN can operate only one channel at time (and so the sniffing). However, a technique called channel hopping allows quick change between channels to collect data. A tool to perform this is kismet, which can hop up to 10 channels/second. Managed: when the wireless client connects directly to a wireless access point (WAP). ad hoc mode: devices connect directly to each other, sharing the responsibility of a WAP. Master mode: the NIC works with specialized software to allow the computer act as a WAP for other devices. Monitor: used to stop transmitting and receiving data, and start listening to the packets flying in the air. Wireshark plugin for writing dissectors in Python. Using Wireshark to check for DNS Leaks. Using Wireshark to Smash the Yak. Common Types of Network Attacks.